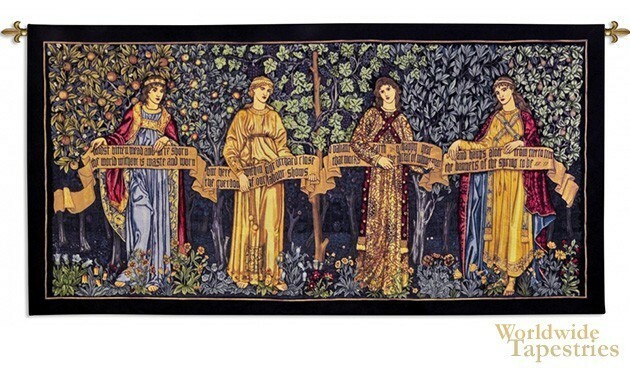 This tapestry shows "The Orchard" based on the work by William Morris, the original of which was designed in 1890, and is now in the Victoria & Albert Museum, London. The Orchard was a work by Morris which was commissioned by art lovers who wanted unique decor for their homes, in the figurative style, converting a poem into an image. The poem reads "Midst bitten mead and acre shorn, The world without is waste and worn, But here within our orchard-close, The guerdon of its labour shows. O valiant Earth, O happy year That mocks the threat of winter near, And hangs aloft from tree to tree, The banners of the Spring to be". Here we see four figures in the orchard of apples, grapes, olives and pears, dressed in exquisite garments and head attire. They stand on a field of flowers in the forest floor. This tapestry "The Orchard" is backed with lining and a tunnel for ease of hanging. Note: tapestry rods and tassels, where pictured, are not included in the price. Dimensions: W 100" x H 48"